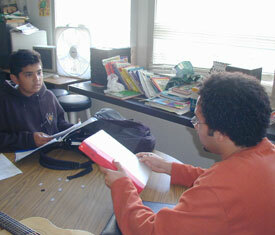 Jon Brack (right), program director of Berkeley Scholars to Cal at Stiles Hall, checks in with Sergio Gomez, a seventh-grader at Longfellow Middle School in Berkeley, about his weekly homework assignments. It’s common knowledge that mentoring helps students with their studies. But what if a fifth grader were guaranteed a mentor for eight years straight, for four to six hours every week? And what if that student and his or her family received other services to help keep them on track? This kind of attention is more than just a dream for 40 at-risk Berkeley middle-school students in the Berkeley Scholars to Cal program at Stiles Hall, a nonprofit center adjacent to the UC Berkeley campus. The youngsters, paired with 40 undergraduate mentors, are in their third year of the program, which will see them through high-school graduation. “One of the goals is to give students the belief and the opportunity to succeed. The students respond; the families respond,” says John Brack, the program’s coordinator. Among his duties, the recent Berkeley graduate spends four afternoons a week with the young students, checking their notebooks and discussing school and home life with them. In addition, Brack coordinates a Saturday “academy” on the Berkeley campus, where the scholars work with their mentors one-on-one for close to two hours, as well as participating in an hour of group activities. (The academy goes to five days a week for the month of July.) According to Brack, the program has resulted in higher grades for the students and more involvement from their parents. The mentors also have the young scholars spend time with them on campus, to afford them a close-up view of college life. To remain in the program, each middle-school student must have a family member willing to be involved. Most of the time it’s a parent, but in some cases it’s an aunt, uncle, or older sibling. “A family member’s involvement has been an important element in the success in the program,” says Brack. The families have formed a parents’ council, which meets about once a month, with subcommittees that meet more often. As important as the mentors and families are to the program, another key element is the relationships that have grown among the youngsters. “The peer relationship that develops among the mentees is invaluable,” says Brack. “There are 39 kids in the same situation as you.” Most are in classes with other scholars, and they all have the opportunity to spend time together on Saturdays and, occasionally, after school. Their fellow students provide consistency as well, because the mentors may change over the years, for reasons including graduation from Berkeley. And while he acknowledges that David is getting the lion’s share of benefits from the program, Houston feels he has profitted as well. “Overall, Berkeley Scholars to Cal is one of the best experiences I’ve had at UC Berkeley,” he said. “Being part of the program was like being part of a family, a community. When seventh-grader Antonio Hernandez met his mentor, Marina Perez, he was initially disappointed. “He had wanted a boy,” said Perez, who has been Antonio’s mentor since the program began. “So I told him, ‘Yeah, but I’m cool.’” The middle-school student was impressed by how much Perez knew about sports, and he taught her how to play soccer. Antonio’s parents are not fluent in English, so Perez acts as a liaison between the school and the family. She has met with Antonio’s teachers and the school administration to help work out problems and get answers to his parents’ questions. While Berkeley Scholars to Cal is only one of the many tutoring and mentoring programs run by Stiles Hall, its director, David Stark, thinks it has the potential to be its most important one.